Essentials Oils – Things I Love! These days it seems I can’t walk two blocks in New York City without hearing someone talking about essential oils. They’ve become that popular! I must say I resisted getting into them for sometime, but after visiting a friend who was super into essential oils and even sells them herself, I gave in! She sent me home with a few samples in addition to all the sampling I did while visiting her and I was obsessed! I really love peppermint and lavender (basic but so good) and now I am thinking about buying a diffusor for my house. For now I bought some roller ball vials that I fill with liquid coconut oil and a few drops of my favorite oils and I rub that one my temples, wrist, collarbone and behind my ears when I need a pick me up or calm down depending on the oil used. If you are interested in learning more about the brand of oils I use (Do Terra) check them out here. I will admit I am still learning a lot about oils so their website will be a much better resource than me but definitely check it out and let me know your favorite oils! I’m so sorry it’s been so long since I’ve signed in on here. I was incredibly sick this winter with the mumps and I feel like I am just getting my life back on track now. I promise to write more often now that my health is better! Combine sugar, water, and ginger in a small saucepan over high heat. Cook until sugar ­dissolves, stirring with a whisk. Remove from heat; cover and let stand 15 minutes. Strain; discard solids. 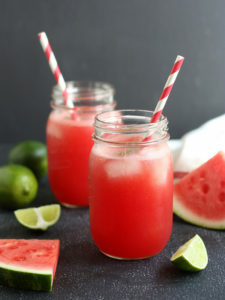 Working in batches, place diced watermelon and fresh lime juice in a blender; process until smooth. Strain watermelon mixture through a fine sieve into a pitcher; discard solids. Stir in sugar syrup and chilled club soda. Serve over ice; garnish, if desired. I wanted to share this amazing cocktail I recently made for a dinner party that was a huge hit! It’s fall inspired and is perfect for this time of year when cranberries are in season. You have to try this for yourself and tell me what you think! I simply cannot get enough. Combine vodka, lime juice, cranberry juice, and agave nectar in a shaker over ice. Shake vigorously and pour into a chilled coupe or martini glass. Garnish with fresh cranberries or a lemon twist, if you like. I just realized I’ve never shared any of my favoirte recipes with you all on my blog! I’m always saving recipes to Pinterest and bookmarks. I don’t think I have any actually printed out except ones passed down from my Grandmother. Sometimes links get broken and I can no longer find old recipes so maybe that’s a hint I should printing some of these out! Ha! 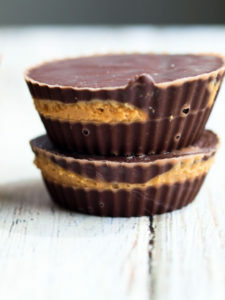 I made these super yummy peanut butter cups last night when I was having a craving. I was tempted to walk to the corner store and buy a package of Reece’s Piece’s but they’re so overpriced for what they are and not as healthy as making from scratch. I bring these to parties all the time and keep them in my freezer so they don’t go bad and I can just take a couple out to thaw when I need to satisfy my sweet tooth. They’re honestly so easy to make and totally worth it! Comment below if you give them a try! Next, use a teaspoon or a ¾ teaspoon to drop ¾ teaspoon peanut butter on top of the chocolate. Finally, add an additional teaspoon of chocolate on top of the peanut butter. Again, you can lift and drop the cookie sheet to help the chocolate lay flat. Or you can use your finger. ? So, my favourite yoga instructor in the world recently left the yoga studio I go to! This yoga instructor, whose name is Rebecca, has been my instructor there for five whole years. She was my instructor when I first started practising yoga and was so inflexible I could barely touch my toes, believe it or not! Rebecca and I got along very well right from the start, and she became a good friend who genuinely cared about my health and improvement. Over the years, she’s helped me become much more flexible and healthy. It’s with a heavy heart that I now see her move across the country to pursue a different opportunity. Of course, as sad as I am about it, I’m happy to see that she’s growing in her career and pursuing some great opportunities. Given that I’ve been practising yoga for five years under one of the best instructors ever, I now pretty much know all of the poses and can do them reasonably well. I’m thinking that, in light of that, maybe I no longer need to attend yoga classes and can do my own DIY yoga in the comfort of my living room. The one thing I’ll probably miss about going to yoga classes is the great community of people that go. It’s always so much easier to push your boundaries in yoga class and shoot for the moon when you’re surrounded by other energetic people doing exactly the same thing. From that perspective, having access to an instructor is only part of the reason why you’d want to go to a yoga studio – the other half of it is being surrounded by community of people who will help you do your very best. Anyway, right now, I think I’ll try to set up my own DIY yoga studio in the living room in my apartment, and see how it goes. Wish me luck! Did you know how important vitamin D is to a healthy lifestyle? I just finished doing a bit of research on the subject and decided to make some changes to my health regime to make sure that I’m getting enough vitamin D.
I used to live in the Pacific Northwest before moving to New York. If you have ever lived in that part of the world or anywhere like it, you know that sunshine can be few and far between. However, sunshine is a very important source of vitamin D which your body needs in order to be healthy. In addition to getting vitamin D from sunshine, you can also get it from certain foods, like red meat. You can also get vitamin D in supplement/vitamin form, or from a tanning bed. I’m not really the sort of girl to use a tanning bed, given that I prefer a more natural lifestyle. In addition, I don’t eat a ton of red meat. As a result, it can sometimes be a challenge, especially during a long winter or cloudy spell, to ensure that I’m getting enough vitamin D. Luckily, I have some friends with a small apartment down in Tucson, Arizona. Sometimes I’m able to get a last minute flight there pretty cheaply, and even staying the weekend and charging up with a bit of sunshine to be a welcome respite. Some of my friends have invested in what is known as SAD lamps, (SAD stands for seasonal affective disorder) which are special lamps which generates artificial light that simulates actual sunshine. Although I’m not sure if they actually help produce vitamin D within the body, they have been known to combat depression and other symptoms associated with lack of sunshine. I just a little bit of a Google research and found this great article on SAD lamp. Maybe something I’ll check out in the future! How about all of you? Any issues with lack of sunshine where you live? Moscow Mule Mugs – Things I Love! I recently discovered a new product that I absolutely love! Christmas is coming, which means plenty of time with family. My family tends to enjoy having a few drinks every now and then, and Christmas is no exception! My brothers and sisters and I also love making different cocktails, and even having cocktail making competitions. Grandpa apparently has the most experience with cocktails (he jokes that he has been around since they were invented) so he is usually the judge! Anyway, I recently bought a six-piece set of these gorgeous Moscow Mule mugs, which I’m very excited about bringing out at Christmas with the family this year. I love Moscow Mules but have never made my own using real copper mugs. I’ve been practicing making them (a girl needs to make sure she beats the competition!) and have been amazed to see what a difference serving it out of a copper mug can make. The copper adds a special flavor to the drink which is hard to describe but works perfectly! How about you guys? 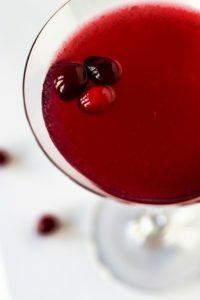 Does your family enjoy cocktails or other fun beverages during the holidays? Hello lovelies! It’s Danica writing to you, straight from New York City! Have I got news for you. So, as many of you know (many of you being my friends in real life!) I have had long flowing locks for many years. Well, recently I decided to freshen things up, get rid of my split ends, and try some something completely different. When I told that to my hair stylist, Pierre, her suggested I try going for a shorter style… particularly, a bob cut! The idea was tempting, particularly since one of my best friends recently went that route and things turned out quite nicely for her look. Anyway, I decided to take the plunge and am now sporting a brand-new style that ends a couple inches above my shoulders. I also had it colored, so it’s now a lovely caramel color, that isn’t quite blonde, and isn’t quite brown. Pierre thought it came out beautifully, and I couldn’t agree more! The bob cut is really easy to take care of. I also found a ton of great tutorials online, especially on YouTube, about how to style my new cut. Here are a couple photos of my new look. Let me know what you think!